I have a tradition to welcome the New Year. I smoke a cigar at midnight. In a way, it's just like handing out cigars when you have a baby. We sometimes depict the year ending as an old man and the new one as a baby in a diaper. This is not so different. Cigars have long been associated with wealth and influence. Smoking a cigar is a way of showing the world that you're prosperous. What more effective means is there to declare you have money to burn than to fire up an expensive cigar? And each year, Santa helps me keep this tradition by bringing me cigars on Christmas Eve. He puts some in my stocking every year without fail, this year included. There will be bonfires and fireworks, and they're nice in their ostentatious ways, but I prefer the quiet glow and flavorful smoke of a good cigar. To say 2005 was not a good year would be a massive understatement. We took it on the chin in New Orleans, with Hurricanes Cindy, Katrina and Rita. The whole Gulf Coast was on the ropes at one time or another this year, and the referee is still counting over some places, uncertain if we can or will get up again. This January 1st, I am certainly many thousands of dollars poorer than I was last January 1. At this time last year, I had a beautiful house, nice furniture, books and art and boxes of mementos and photographs of family and friends that are all lost to the flood brought by Hurricane Katrina. But I will still light up a cigar at midnight. I will in my own quiet way remember what I have and not grieve for what I have lost. I have a nice place to live, food in great supply, clean clothes and hot water. I have a good job with challenging work, full health insurance and money in a retirement account. I have a TV and a DVD player, and music and a computer to amuse me. And I have a lovely wife and a wonderful daughter, and family and friends who are happy to see me and eager to help when I need it. It's New Year's Eve, the last day of 2005, and as I cross that threshold into 2006, I will not do so richer than last year. But prosperous? You betcha! Wealthy? Absolutely! Happy? Yes indeed. That's a headline from today's edition of The Times-Picayune. The story made me angry and sad at the same instant. A Lower 9th Ward man who saw his mother die on the roof of their home as Hurricane Katrina's floodwaters rose in their neighborhood, returned Thursday and found their house collapsed and her skeletal remains in the rubble, police said. The body was tentatively identified by police as Joyce Green, after her son found her remains in the debris outside their home about 3:30 p.m. in the 1600 block of Tennessee Street, said officer Juan Barnes, a police spokesman. Her son, whose name wasn't released by police, told police he and another relative had taken refuge on the roof of the home with his mother after the Industrial Canal levee broke, police said. He told police his mother died before he and the other relative were rescued and evacuated from New Orleans. After returning to New Orleans, the son told police that he went to the home Thursday and found his mother's remains. The grieving son said he recognized her body from the clothes she was wearing at the time she died. Imagine the horror and the guilt this man must feel. Yes, his mother had already passed on when he left her, but to know that her body lay in the trash and debris, unceremoniously disposed of in the heap of garbage--that has to weigh heavily on his mind. And how did this happen? How could a human body remain unfound, undetected in the middle of a major city for four months? How could this happen in America? What are we going to do to protect this city from ever having this happen again? Sadly, this story is being repeated over and over as people come back to New Orleans. The body count is not complete. The suffering brought by Hurricane Katrina continues. World Famous Rock'n'Bowl. That's where I was last night. The first thing people usually ask about Rock'n'Bowl is, "Is it really a bowling alley?" The next thing they ask is, "Do they really have live music?" It usually takes a minute or so before the next question, but it finally comes. "Can you bowl while the band is playing?" Located on the second floor of a strip shopping center on the corner of Carrollton and Tulane Avenues, Rock'n'Bowl is everything a New Orleans music club must be to thrive in this town: funky, funny, affordable, ecclectic and a little run down looking. And what about the music? 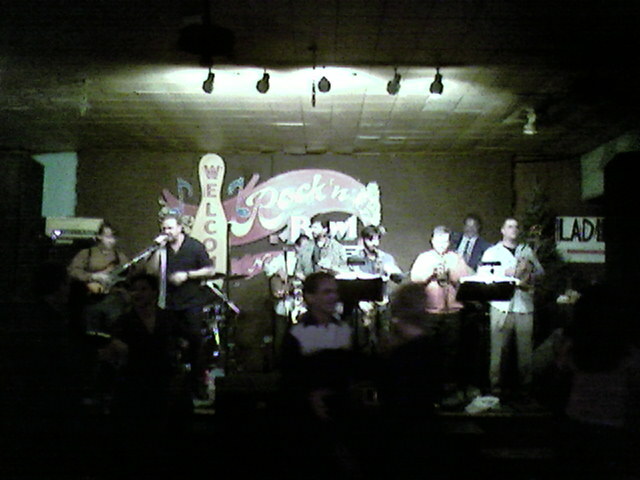 Last night was The Boogie Men, a horn-powered mega smash dance band that's been making a name for itself for I guess about a dozen years. You like it funky? They can do that. You like rock? They can do that too. The emphasis is always on the dancing, though, so no matter what era or style of music they're playing, the floor is filled with moving feet. Since this was not a school night and the band started early, I took my daughter with me. Her primary observation: "It's LOUD!" Well, yeah, they do that too. We danced to a few tunes, and I'm sure she was very impressed with my moves that have not changed since the 80's. As always, Owner John Blancher was there, meeting and greeting and genuinely enjoying things. He's the man who took the World-War-II era bowling alley and turned it into an internationally known icon by mixing pins and pop music. John especially loves Elvis, and is known for hosting a birthday party for him each year and dressing up as the King himself. If you stay late enough, you might even catch John and the bar keepers hula-hooping to the music. Rock'n'Bowl survived Hurricane Katrina and the flooding that filled Mid City unscathed since it's on the second floor. Still, getting the place back up and running in this decimated city was a feat for which you have to give John due credit. My girl wanted to bowl, which is a unique experience there. When the band is playing, the house lights are dimmed. The pins glow in soft white light at the end of shadowy alleys. And you can't hear a pin drop because, as my girl noticed, "It's LOUD!" We only bowled a few frames and didn't do a good job of keeping score, but somehow my daughter decided that she had 37 and I only had 22. We left near the end of the first set because it was after 10 and she's not usually up so late. Ultimately, I think her favorite part of the outing was the Ms.PacMan machine. 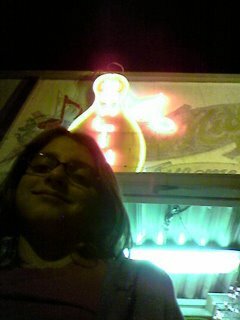 Nine years old and begging for quarters like a strung-out junkie, I guess that's what I once sounded like, too. I took some photos with my cell phone and posted them here, but these lo-res images don't do it justice. The joint was jumping last night, you'll just have to take my word for it. And, I'm sure my daughter would add, "It's LOUD!" I visited with some old neighbors last night. Well, I should say, "prior neighbors of several years," because they are both many years from AARP eligibility. They used to live right down the street from me here in New Orleans. My daughter used to ride her bike down to their house to play with their oldest daughter. And it was not uncommon for us to get a Saturday morning phone call from their girls asking if our calendar was open. When Hurricane Katrina came to town, they packed up their two girls and assorted cats and headed to high ground. When it was all said and done, they landed in Denver, Colorado where the husband's company has an office that needed help. The wife works for the federal government and also found work with the same agency there. And the girls, well, you know how easily most kids can adapt to new surroundings. So they came back to town for a few days, to rescue some belongings from their flooded house, to visit family and friends, and to chart their return course. The husband is a mechanical engineer and I'm a civil engineer, so when I saw him he almost immediately asked me to sit down so we could talk about the levees. "The news we get from CNN in Denver is crap," he said. "Tell me what's really going on here." He knew I'd have the scoop on what the real situation is here, and he asked very specific, insightful questions. I filled him in on the current effort to fix the levees, the initial findings on why the city flooded, and the plan to build more significant hurricane protection if the feds will fund it. 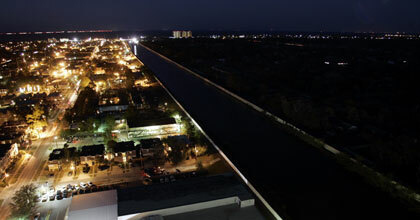 "So, basically, we'd be crazy to rebuild until the levees get fixed," he said. "I mean, it doesn't take a rocket scientist to figure that out." Did I mention he's a rocket scientist? Well, he is. He works for a company that does a lot of work for NASA. He's been hands-on with the Shuttle program, so he knows a thing or two about quality control and risk assessment. He quickly agreed with me that the risk of living with 100-year flood protection just doesn't cut it. And he understands that rebuilding right away and the same way, before the failed levees have even been properly fixed, much less improved, is not a good plan. Let me be clear about this: I want to rebuild. I think we should rebuild. My only reservation is that we have to rebuild better and smarter. I think New Orleans needs and deserves significant hurricane protection--much more than what we have now. And I think we need to rebuild our homes and businesses higher, so that if and when the streets fill with water, the impact will be lessened. I'm waiting on the federal government to take care of elevating the levees, and I'll take care of elevating my home. So where does this leave us, we two neighbors who now live a thousand miles apart? They head back to Denver on Monday, and I will continue to live in my apartment in the "sliver by the river." And two families continue to hope for good news. Photographer Mark Rayner has posted dozens of photographs of New Orleans after Hurricane Katrina on his Wild Dog Digital website. The most recent photos illustrate how one part of town, Gentilly, remains almost totally dark even 121 days after Katrina hit us. Be sure to click on each photo to read the narration. It's hard to imagine that thousands of homes are still deserted at this date. Mark also writes, "While there has been amazing progress in cleaning up the city of debris left by the storm, there is still an incredible amount of work to be done." Christmas Eve and Christmas Day were spent with family, gifts and talk, perhaps no different than the many such annual gatherings as before. But it was not the same. How could it be? For one thing, Christmas after-lunch talk was all about Katrina. My various relations from St. Bernard Parish each had a strange and exciting story to tell about what happened to them when Hurricane Katrina came, or what happened to their neighbors, or worst of all, what rumors they had heard about what happened when no one was looking. It was just a little overwhelming. And then my brother, who had not come to visit this Christmas, called me with holiday greetings. I had thought he was spending time with his wife's family, or hosting people at his own home this year and that's what prevented him from visiting us. But no. He told me the reason he did not come to New Orleans this year was because he did not want to impose. Impose? Since when is it an imposition to visit with family during the holidays? I scolded him of course, and told him that family is always welcome under any circumstances. At least that's my rule. Over the course of a long conversation, he explained his reasoning to me and I give him credit for at least trying to be considerate. But as I've written here more than once, things like houses, clothes, cars and other things really aren't what makes life good. Life is about interacting with others, especially loved ones. In the end, I probably came down too hard on him. After all, he's living in a whole different state and can't possibly fathom what is really going on here. Yes, there's devastation. Yes, there's decay and debris throughout the city. A lot of people away from New Orleans don't understand that; my brother perhaps understands it too well. But there is life and hope, too. Although the city is mostly dark, there are Christmas lights. Although the gardens are brown and drowned, there are new leaves sprouting from the earth. Although our homes are shattered and uninhabitable, families gather to share a meal, talk and celebrate. It is what we did in the past, what we do in the present, and what we will do in the future. My friend and fellow New Orleanian Bart posted an entertaining account of how he spent Christmas Eve this year. Naturally, the whole evening revolves around food. The power just got turned back on this week at his house in Mid City, so he makes some interesting observations of his own regarding the Sweet Light. Hey, Bart, more power to ya! It's Christmas Eve, the day before the day chosen to remember the birth of a baby. It's popular to think of Christmas as being the "reason for the season," but as anyone who knows their history and theology knows, the winter celebration is about more than Jesus. The deepest, darkest day of winter, the Winter Solstice, has always been an important day for humans. That's when the new year used to begin. That's when the days would begin to grow longer, and the promised return of spring became real. It's unfortunate that over the centuries the calendar has been adjusted, corrected and manipulated so that the new year no longer falls on Winter Solstice. And it has also been the custom to celebrate the arrival of kings and man-gods on Winter Solstice. Jesus is just the latest to receive this honor, although again, various circumstances have skewed things so that Christmas misses Winter Solstice on the modern calendar by four days. And we cannot overlook Hanukkah, another religious tradition that recognizes the despair of darkness, and the hope of light. It is no accident that all of these things come at this time of year. This is the season of lights, a time when all of us can celebrate the changing of the season, the elongation of days, and the return of light. With the new year come new opportunity and hope. New Orleanians are experiencing this in a very special way this year. Having had our city ravaged by Hurricane Katrina, we are more than ready for a new beginning. We're ready to close out 2005, a year that will reside in the history of catastrophe next to 1965 and 1927. We're looking for any sign of help, any indication that this winter will end soon, and that our city will again bloom. The darkness is inescapable. Whole areas of the city, neighborhoods and boulevards that used to be lit up with life are now dark. Even the street lamps are off. Even the porch lights are extinguished. To celebrate this season of lights, some of us have put up the traditional holiday decorations. In the part of the city where I now reside, the "sliver by the river," there are homes and businesses with bright and colorful Christmas lights. And why not? We need the light. We crave the light. I continue to cling to the belief that the light is coming. I have hope this season of lights will be the threshold to better things, the birth of a new year that will bring a new New Orleans. I hope everyone heard the interview on NPR's Weekend Edition this morning with hurricane Katrina evacuee Randy Adams. If not, you can click here to listen to the story on NPR's web page. Mr. Adams explains why he has returned to New Orleans, and recounts some of the difficulties he is experiencing. It runs about 4 minutes, but the most important part is at the end of the interview when he says, "I would like to share one other insight..."
Mr. Adams is what we would call "good people." Best wishes to you, sir. Welcome home. As fellow blogger Polimom says, "they should NOT still be finding bodies" in the Lower 9th Ward. Well, this is a banner day in my life. Anyone who's visited this blog before knows how my life was blown off course by a nasty hurricane in late August. We're all still recovering, and some of the small steps back to that place called "normal" have been documented on this blog. But now comes a big one. Back in September, Mayor Ray Nagin ordered a mandatory evacuation of New Orleans. He issued a second such order a few weeks later when a second hurricane threatened our waterlogged city. And he declared the first universal curfew for the city of New Orleans in my 44-year lifetime. Today's big announcement is this: residents of all areas west of the Industrial Canal are now free to return to their homes. Permanently, if we choose. That means people can officially reoccupy their homes in Gentilly, Lakeview, the Upper 9th Ward and other areas in four ZIP codes: 70122 and 70124, as well as parts of 70117 and 70126. The rest of the city west of the Industrial Canal was already open for returnees to stay. Yep, 70122, that's my neighborhood! That means I now have official permission to not just visit my devastated home during daylight hours, I can now sleep there if I want to. Why would I want to sleep there, in a house that was filled almost to the ceiling with putrid flood water for about two weeks? Why would I want to sleep there, in a house that is still littered with soggy and shattered furniture, popped and puckered floors, and a kitchen made foul by an overturned refrigerator and a collapsed pantry of rotting food? Why would I want to sleep there, in a house with no gas, no electricity, no sewerage, and water pressure so low that we are warned it could be difficult to fight a fire if one occurs? Why would I want to sleep there, in a house that lies in the shadow of the shattered London Avenue Outfall Canal, whose two rocky patches are still leaking into the adjacent streets? Officially, my neighbors and I have permission to go home. But no one in his right mind will. Unless and until we fix those levees, restore basic utilities, and get some assurance that at least a few neighbors will join us there, no one in his right mind will return. Heck, FEMA won't even put a travel trailer on my street until we get electricity and sewer service back online. So although today, December 23, 2005, is the official day I am permitted to go home, I think it will be many months before I am able to go home. Here's an interesting editorial lamenting the short attention span of the federal government and the media. The recurring themes in all such pieces are that no one really understands how bad it is until they come here and see it in person, and that much, much more needs to be done to help. The writer was surprised by the lack of traffic signals through most of the city. If he had been a regular reader of this blog, he would have known that before coming to town. An apology to my friends and family who have been faithfully checking here for news and updates but have found nothing new to read for the past few days. My excuse is simple: I have this pesky job that takes me out of town every now and then, and I can't post when I'm on the road. I think we all know what I'm talking about. Sometime in the 1970's, a New Orleans entrepreneur invented a wicked blend of spices to make fried chicken something to get excited about. Oh, there were Kentucky Fried Chicken and Plantation Chicken outlets in every city in the south long before then. But no one had ever tasted anything like the cayenne-fueled fire of Popeye's recipe. When the first couple of Popeye's restaurants opened here in New Orleans, there were lines of people waiting to get that golden goodness before you could say, "Gimme two pieces, dark, spicy with fries." And the epidemic quickly spread to the rest of America. From the beginning, the advertising and decor of Popeye's were made as loud and wild as the flavorful poultry they served. "Love that chicken from Popeye's," the ads sang. You know the tune. "Made the New Orleans way." And in all the mess left by Hurricane Katrina, I had not noticed until recently that all the Popeye's in New Orleans are closed. I know I've written more than once about food and restaurants here, but there's a reason I have not written about fast food. Because in New Orleans, there ain't no more fast food. Not even the spicy New Orleans original. I noticed this because when you leave New Orleans and travel several hundred miles away as I did earlier this week, there are fast food restaurants on every corner. Even Popeye's, which strikes me as just a bit ironic, since it is apparently easy to get New Orleans flavored fried chicken everywhere except New Orleans right now. How can I be making a big deal about a fast food restaurant? Because Popeye's will forever in my mind be that constant touchstone. No matter where I go, I know I can find home in that garish, greasy goodness. About 25 years ago, for instance, I went through Army Basic Training at Fort McClelland, Alabama. Our barracks faced a large parade ground. Across the parade ground was one of the gates to the post. Outside the gate was a highway. Across the highway were several small businesses, including a Popeye's. I don't know how popular Popeye's is in other towns, but in New Orleans you could walk to one no matter where you lived or worked in the city. I just looked in the phone book and counted 20 in New Orleans proper, and 20 more in surrounding parishes. I've heard that some of the Popeye's in neighboring parishes are open, but most, including all in New Orleans, have not reopened. There was some excitement a couple months ago when Cafe du Monde across from Jackson Square reopened. I'm thinking the Mayor is sure to be there to cut the ribbon when they reopen the first Popeye's here. I watched the President on TV last night. He talked about why it was necessary to send 140,000 troops overseas to fight. He talked about how the death of more than 3,000 people on 9-11 warranted his pro-active deployment of the US military. He talked about the importance of building stable nations that will be our allies in the middle east. All this to justify spending (at last count) $251 billion overseas. What he did not talk about was his plan to rebuild South Louisiana--if he has one. Prior to the arrival of Hurricanes Katrina and Rita, we knew the Louisiana coast was washing away. We tried for years to get someone in Washington to notice. We even joked that the best way to get federal assistance would be to rename our state "Louis-istan" and our cities "New Baghdad" and "Baton Ramadi." Being perfectly brutal, if the loss of 3,000 lives is worth spending $251 billion overseas, how much is it worth to mitigate and protect Americans living and working in Coastal Louisiana after more than 1,000 were killed by just one hurricane? Yet there is disagreement on Capitol Hill. Some think the currently proposed $3.1 billion is too much. That's how much was proposed by President Bush last week to patch up our hurricane protection system. Not to upgrade it, mind you, just fix it so that it might provide the same level of protection as previously authorized in 1965. But even with the president's backing, there is no assurance the bill will pass. Perhaps it's because President Bush's support is lukewarm at best, or, perhaps it's because Americans don't care. The undercurrent is that Louisiana politics is crooked and we made this bed ourselves. The truth is that hurricane protection is a federal responsibility, with funding, design and construction all controlled by the federal government and the Corps of Engineers. Sure, we have more than our share of rotten apples. Former Governor Edwin Edwards is just one of several past public officials sitting in jail today for fleecing the good people of the Pelican State. But where's the connection between "Fast Eddie" and the Corps? Where are the payoffs and kickbacks that resulted in low levees and walls that could not hold back a Category 4 storm surge? You might as well point to the failure of the Saints as the reason New Orleans flooded--there's probably just as much correlation. No, the failure was at the federal level. Congress, the President and the Corps of Engineers signed off on hurricane protection that provides just 100-year protection. That is, there is a 1 percent chance that the levees will be overwhelmed in any given year. Let's face it, those are not good odds. Now that we've seen what a terrible tragedy our gamble has caused, it's time to fix it, and fix it right. The Corps has estimated that significant hurricane protection can be built for about $32 billion. That's ten times what the President has offered, but still a fraction of what he is eagerly sending overseas. And it's a drop in the bucket to the damage and destruction caused by just one weapon of mass destruction, commonly known as Hurricane Katrina. The power turned back on by Entergy. And the power turned back on by Entergy. And the power turned back on by Entergyyyyy! Today I found this picture in the online Christian Science Monitor, and I have to admit I found it moving. The cragginess of dried sediment is what we would call "alligator cracking," because it reminds one of the random creases on alligator skin. The photo from the Ninth Ward of New Orleans, perhaps 5 miles from my house, looks remarkably just like the dried mud that I found covering my driveway and patio. It's something we who flooded all share. And yet, standing in the middle of a city destroyed by nature, more than once I have caught myself admiring the strength, resilience and beauty of nature. Dragonflies, for instance, those colorful, delicate and amazing flyers, are abundant in my yard now. How did they survive the wind and flood? And another time, looking at my dead lawn and my wife's drowned garden, I noticed a single green plant (I don't know, it looked like a tomato plant to me), pushing up through the dull grey and brown that is death and dirt. The good news is that we humans are also part of nature. We, too, are resilient and will rise. "If the Netherlands can protect its country from the ocean then surely America can protect New Orleans from a lake." These sound like the words of an elder statesman, someone with a roomful of speechwriters to help hone the message into crisp sound bites. But these are the words of Judith Kaufman, a mother of three who fled the devastation of Hurricane Katrina to the safety of Pennsylvania. Far from home and frustrated by the slow or non-existent response from Washington, Kaufman found a voice that is now being heard. "The quintessential purpose of government is to protect its citizens," said Kaufman. "We are asking the federal government to protect our city with a levee system, a model for the world, so that the people of New Orleans know that when they come back and rebuild and reinvest it is not in vain." Kaufman and neighbor Shawna Doremus, also evacuated to the Keystone State, decided to take their message, their plea, straight to Washington. Too far from New Orleans to physically help rebuild their beloved city, the two decided to organize a rally in front of the White House on Wednesday, December 14. From Pennsylvania to Pennsylvania Avenue, you might say. "We are Americans, we are taxpayers, and Judy and I both personally represent small businesses," said Doremus. "We are asking Congress to just help us help ourselves recover." Let's hope Congress and the President are listening. For more information visit the Rally for New Orleans web site. We had red beans for supper tonight and talked about Christmas. It was fabulous! Since Katrina, the simplest things bring us the most joy. Red beans are the quintessential Monday meal in New Orleans. I've heard this is because Monday is the traditional wash day, the day when the women folk used to do the laundry. It was easy to cook a pot of beans on the stove while you were out back hand washing and hang drying the clothes. And you know people in New Orleans plan their lives around food, and they turn every problem into a party. So they made Mondays and the simple pot of red beans into something to get excited about. What made these beans especially good was the sausage from Terranova's Grocery. We lived for a while on Esplanade Avenue just a few doors down from this corner grocery. The Terranova family all help run the store on the street level and live in the rooms upstairs. I don't know if the store flooded, but they just reopened last week to the delight of the whole neighborhood. My wife was one of their first customers that day. During supper, we started talking about Christmas, and presents, and the jolly old elf himself. My daughter, a fourth grader, recently mailed her annual letter to Santa and steadfastly refused to let us see it. Her plan, she explained, is to provide a different gift list to each gift giver, thus improving the chances that she'll get everything she wants and avoiding the duplication of presents that sometimes occurs. My first reaction to this was shock. You don't hand out gift lists like a foreman handing out assignments. You're not supposed to assume that people are going to give presents out of involuntary obligation. It struck me as rather rude, and I was thinking about how I would tell her this. But then she confided and told us what she was asking for. From Santa, a bike. From her Nanny, a soccer ball. And from us, new sheets for her bed. Let me be clear about this: we are not poor. We could certainly afford to buy my daughter two bikes, a television, an X-box and a gaggle of games to go with it. But since Katrina we're trying to keep it simple. We moved into a two-bedroom apartment and bought the furniture from the prior tenants. We only have two sets of sheets for our two beds. But our girl does not complain. She does not pine for the gadgets and hip toys that television loudly tells her she needs. She does not want us to give her things that are large, loud and expensive. She just wants a new set of sheets. Comfortable sheets to rest on and read, sheets of her own. Since Katrina, the simplest things bring us the most joy. It's good that someone outside of Louisiana understands the situation so completely. The people of South Louisiana can and will rebuild. We just need the promise of adequate levees to protect us from the next hurricane. Empty rhetoric will not stop a storm surge, and it will not give homeowners and businesses the confidence to rebuild here. Sure, some people will live in New Orleans no matter what happens. But this great city, this metropolis that in the early decades of our country was among the largest in the nation, and is the port of choice for Latin American trade and the heart of the Energy Coast, will be no more. New Orleans will be just a small town where tourists visit the pretty, old, empty buildings. As The New York Times says, we need some straight talk from the President. Either he supports rebuilding New Orleans better, or he tells us up front that it's not going to happen. We at least deserve that much, don't we? I also notice The New York Times compared the cost of providing real hurricane protection to the total 2006 federal budget and to the cost of our military expedition in Iraq. Perhaps the editors have been reading my blog. I used those same comparisons and also quoted the President's speech from Jackson Square in my post last month titled The Whims of Nature. It finally happened to me. I knew it was just a matter of time, and sure enough my turn came on Friday. As I was leaving the office and walking up to my car, I saw the flat tire. What can I say? I knew it was coming, and yet I felt deflated. Since the early days of recovery from Hurricane Katrina, people driving around New Orleans have done so at their own peril. When I came back to town in late September, there were still wires dangling from poles, trees and buildings. There were trees leaning uncomfortably and a lack of traffic signal lights and signs. And there was a lot of debris on the streets, debris that often found its way into the treads of tires. A friend who works for the electrical utility company said he was getting two to three flats a week driving around New Orleans. You knew it reached epidemic proportions when the signs began to appear. Along with the hundreds of signs advertising mold removal, house gutting and reopened restaurants, there are the "Flats Fixed" signs lined up along the major roadways. But this is December, you say. Isn't the debris all picked up by now? Well, mostly. But now we're into reconstruction mode. All over town roofers are working dawn to dusk to install new shingles where blue tarps now reign. I have no doubt that the majority of nails and sharp trash tossed into the streets by Katrina has been cleaned up. Now we're contending with nails dropped by roofers, construction crews, and even the trucks hauling the construction debris away. When I pulled my shapeless tire from the car, sure enough I found a squat, wide-headed nail stuck between the treads. It was shiny new, so I'm pretty sure I can blame the roofers who have been working in our neighborhood and throughout the city. But I'm not angry. Like I say, it was inevitable. How can you repair and rebuild almost an entire city without dropping a few nails? Let's face it, like my tire, the city of New Orleans is largely deflated. Getting angry about it won't make it better. Just as that nail needs to be pulled to make the repair, we've got to pull together to make this place whole again. Of course, my tire will be ready to roll Monday. Fixing greater New Orleans is going to take much, much longer. But I know it can be done, and I know one day New Orleans will be rolling again. We went to Metairie today to get our Christmas tree. It's not like we had a choice. In years past, there were several places along Carrollton Avenue one could get a tree. This year, those same places are empty and deserted. Some have signs directing people to visit their businesses elsewhere, like Metairie. In an act of pure faith, I took the family to the newly reopened Lowe's store on Elysian Fields. The place was busy, as busy as you might expect any retailer to be on a Saturday barely two weeks before the big holiday. We saw lots of trucks carting sheetrock, lumber, and roofing shingles. The only thing we did not see was Christmas trees. My wife asked a man in a red vest with the company logo pasted on it, "Where are the Christmas trees?" "We don't have any," he said. "They got 'em at the Metry store." How strange. Do they think we who live in the damaged city are just going to skip Christmas this year? Do they think we won't use our FEMA and insurance money to get decorations? Do they think all we care about is two-by-fours and linoleum flooring? If nothing else good came from Katrina, it's at least that we've been reminded that it's the people around us who really matter. We were reminded of this quite forcefully I might add. Family, friends and neighbors matter. Bricks and wallpaper and carpet and walk-in-closets are all just superficial trappings. So anyone who thinks this disaster is going to usurp or preempt any occasion to celebrate the good people in our lives just has not been paying attention. We got our Christmas tree today, brought it home and decorated it. I even strung some lights around the door and porch railing out front. We're going to celebrate Christmas, and then we're going to celebrate the New Year, and soon we'll be celebrating Mardi Gras. Under the circumstances, it is the most natural, most sensible thing we can do. We said goodbye to John today. John said he will miss us, New Orleans, and to our surprise, he said he will especially miss Five Happiness Restaurant. John was a co-worker who recently took a job in Tennessee to be with his family. That's where they went when Hurricane Katrina hit. And that's where they're going to stay. We gathered outside our cubicles this morning to give him a farewell present and a card. He assured us how much he loved New Orleans, and said if not for the terrible turn of events brought by Katrina, he would still be here. John was on the verge of tears as he told us how much he loved this town. After all, he said, it was while attending Tulane University that he met his wife. And although he grew up in Florida and she in Tennessee, it was here where they made their home. It was here they brought four children into the world. And it never occurred to me that Chinese food could be so integral to the New Orleans experience, but John gave a touching farewell to Five Happiness Restaurant. The popular Chinese eatery is well known for great service, excellent food, and its bright blue roof. On Carrollton Avenue just south of Washington Avenue, there's no counting how many fortune cookies have been served in over 20 years of business. None of this mattered to Katrina. When her storm surge burst over and through the city's hurricane protection system, about 3 feet of floodwaters doused the Happiness, leaving telltale water stains on the walls and tarnishing the brightly polished front doors. It has not yet reopened. John explained how he had asked his future wife to marry him over a meal at Five Happiness. And how she had told him their first child was on the way at the restaurant. And how it was during a meal there that he and his wife had decided to move back to New Orleans following his service in the Navy. I always knew that everything in New Orleans revolves around food, but I never expected that food to be Chinese. John and his family are some of the best people you could ever hope to meet. Kind and caring, eager to live and love. New Orleans will miss them. I hope one day circumstances will bring them back, and I hope the Five Happiness will greet them when they do. The latest official body count from the Louisiana Department of Health and Hospitals is 1,090. Television portrayed the victims of Katrina to be the historically poor and disenfranchised. But my armchair observation is that the storm hurt and killed mostly the elderly in our community. These are people who are the least hardy to take on the challenges hurricanes bring. The stress of evacuation, the financial burdens and the deprivation of medical support can be fatal. And just as bad can be the after-effects, such as the physical exertion of trying to salvage belongings and repair homes, the stress of financial insecurity and the suffering from emotional losses. You can almost understand why so many older Americans did not heed the call to evacuate. And although the emergency response was phenomenal, the scale of this disaster was just too much. Thousands were rescued in the days after the hurricane passed, by truck, boat, bus, jet-ski and helicopter. Teams of National Guardsmen went through the city, going door-to-door, searching for anyone left behind, helping everyone they could, collecting the bodies of those they could not save. They spay-painted each building to mark their progress through the tens of thousands of destroyed homes and businesses. As valiantly as they tried, they did not find everyone. It is now down to the citizens to find the last of Katrina's victims. Family members, friends and contractors, returning to these sodden homes, enter to find the lost and the forgotten where they died. It's been more than three months since Hurricane Katrina rampaged through our city, but the pain of her attack remains. I write about this not to gross anyone out, but to again try to illustrate the magnitude of this catastrophe. One thousand ninety dead so far. Of the ones identified, 3 out of 4 came from New Orleans. Less than half of the bodies have been released to families. I keep running stop signs. I try not to, really. I mean, besides being totally illegal and expensive if I get caught, it's downright dangerous. But I'm not used to them, and they're hard to notice. After Katrina's destructive flood waters were pumped from the city, virtually all of the city's traffic lights went dark. For some, it was a lack of electricity. Others were blown down in the hurricane-force winds, or had their electronic controls fried in the flood. The result was fairly universal: no signals. The rulebook on this one is pretty clear. When a traffic signal malfunctions and gives no signal, the intersection becomes an all-way stop. Many of my fellow motorists assume that the larger or busier street simply gets right of way by default. The courtesy of the all-way stop took a few days to catch on, and it's a good thing since traffic has been steadily increasing since I came back to town. But then someone--I don't know if it was FEMA, the National Guard, the city, the state, I wish I knew so I could thank them--someone installed a whole bunch of temporary stop signs at all the formerly signalized intersections. Almost overnight, stop signs were set up on tripods all over New Orleans. Order restored, right? I'm just not used to stop signs along Carrollton Avenue. I'm just not used to having to stop at a stop sign on St. Charles Avenue. These are busy, wide boulevards. If there's no traffic in front of me and there's no bright red light shining at me, I tend to just roll on through. I've been trying to get a grip on this, but it's difficult. Old habits die hard. And I guess I'm distracted, too. Usually while driving through destroyed areas of New Orleans, I'm looking at the wreckage of my beautiful city on either side of the road. I'm noticing how high the water marks are on the houses, noticing whether there's a rescue hole torn in the roof, scanning the spray-painted houses to see if they indicate someone was found dead there, noticing which homes and business are being fixed up, and which are still silent and abandoned more than three months after the disaster. I've been driving around New Orleans since the end of September, but you just don't get used to it. It's just not "natural" to have stop signs on a divided, four-lane roadway. And although I know we're still years from "normal," I keep expecting the electricity to come on, and for the signal lights to function. Just another one of those things we take for granted in the modern city. So that's my excuse why I don't always see those squat little stop signs. It might not be a good one, but that's all it is. Let's hope I can get a grip on this, before I end up joining the debris piled up on the sides of the road. Some people from New Orleans talk funny. They're called Yats. When you meet one on the street, they say, "Where y'at?" And then they say, "Whatcha know good?" If you're considered a good friend, they might even say, "How's ya mom an' dem?" Believe it or not, many people are proud to be Yats. Even I, on occassion, have been known to slip into Yat talk. My out-of-town friends think it's funny when I replace the "th" sound with "d," as in, "dis," "dat," "dese" and "dose." Sometimes, I don't know what's up wit dem. Local musician and amateur sociologist Benny Grunch has made a career of celebrating the culture of Yats. A few years ago, he wrote and recorded "The 12 Yats of Christmas," based on the Christmas standard. The locals ate it up. It helps that Benny himself is, well, a Yat. He knows the places and talks the lingo with the best. With no effort, Benny slurs and blurs the words, so that "picture window" becomes "pictcha winda," and "did you" comes out "did'ja." Yats sound a lot like New Yorkers, but with a friendly streak. With the band Benny Grunch and The Bunch, he's recorded several more heart-warming songs celebrating the happy weirdness that flows down every street of New Orleans. Just the titles make me smile: "Ain't Dere No More," "Over By Your Mama'n Nem," and "If I Won Da Lottry For Christmas." All of which leads me to this shameless promo for their recently released CD now on sale through their website and several local stores. They've updated "Ain't Dere No More" to include recent Katrina victims, namely Lakeview and St. Bernard. Well, as Benny says, "Temporarily Ain't Dere No More." 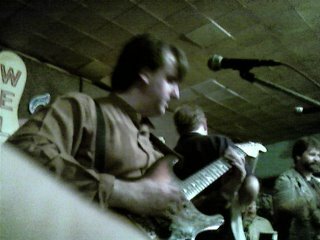 Click the link, check it out, buy a cd from a local musician and have a happy holiday to boot. People are rebuilding in my neighborhood. They're pulling out the soggy carpet and puckered wood flooring, they're tearing out the limp, wet sheetrock. They're piling what used to be their furniture, cabinets, beds and sofas on the curb in front of their houses. People are gutting their houses here and there in my neighborhood, tearing it all out to the studs. They're leaving open all the doors and windows so that the two-by-fours and concrete slabs will dry out. All this in preparation to rebuild. They are getting ready to rebuild just the same as they were before Katrina. Is it just me? Or does this amount to a huge leap of faith? If you have a house that got 5, 6, maybe even 8 feet of water, doesn't that tell you something about how you should rebuild? I can tell you what I will do. My house drowned in 7 feet of water, so unless somebody can guarantee that there will be no more storm surges that top our levees and floodwalls, or unless someone can guarantee that Congress and the President will send us the money to build better protection, and, unless someone can guarantee that those higher levees will be built quickly and correctly, I know what I have to do. I have to build higher. The last catastrophic flood in New Orleans was 1965, so who knows, we might not get another major flood for another 40 years. Or it could happen next year. A few days ago I wrote about the darkness that covers the flooded parts of New Orleans each night. Vast areas of tens of thousands of homes, whole neighborhoods one after another that do not have electricity, do not have residents, do not have any signature of modern life. "The lights of Metairie seem even brighter when just across the 17th Street Canal, New Orleans is a sea of darkness, at night in New Orleans on Friday, Nov. 18, 2005." You live in a house that sits below sea level. The only thing that keeps the ocean and the callous whims of nature from rolling into your living room is a levee. A man-made ridge of earthen materials constructed to keep your life and your property safe and secure. Now we all know that nothing is perfect, and I think we would all agree that nothing lasts forever. But if you’re going to live and work in the shadow of that levee, you probably want to know that every reasonable step has been taken to minimize the risk. You want the probability of levee failure to be low, very low. * If your house is in a densely populated area of the Netherlands, the odds of failure are 10,000 to one. 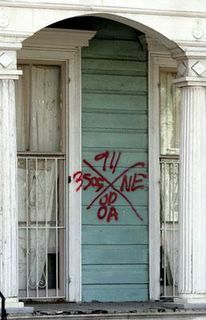 * If your house is in New Orleans, the odds of failure are 100 to one. (To be technically precise, there is a 1% annual chance of levee failure.) This same design standard applies to most federal flood control projects. Think about it this way: As the average lifespan approaches 100, the odds are that almost every person in New Orleans will experience a catastrophic event in their lifetime. For a Dutch citizen, only once in 100 lifetimes. Compare this to commercial air travel. According to AirlineSafety.com, the odds of being on an airline flight which results in at least one fatality is about 1 in 186,000 if you’re flying on an airline that is among those with the worst safety records. That’s 1 in 186,000. If you live to be 100, you’d have to fly 1,860 times a year before the odds of being on a fatal flight match your chances of seeing a flood disaster in New Orleans. But better yet, if you fly on one of the leading airlines in safety, your odds improve to 1 in 4,200,000! It’s odds like these that make commercial air travel viable. So now the question: does the current 100-year standard for flood protection in New Orleans make any sense? Would you invest in a city that will, in all likelihood, flood at least once in your lifetime? I am so rich. I was reminded of this once again at supper this evening. Over the past few months, I received a lot of sympathy from people in Texas, Arkansas, Virginia, South Carolina--everywhere I've gone. People find out I'm from New Orleans, and the sad eyes and the, "Oh, you poor thing," follow. But I am not poor. Since evacuating ahead of Hurricane Katrina, I have not missed a meal. I have slept in a comfortable bed every night. Thanks to my job, my insurance, my family, and yes, FEMA, I remain safely distant from bankruptcy and the poorhouse. Tonight, for instance, we ate lasagna. Let me tell you how rich that made me feel. You might think you would need to be eating caviar and sipping a 1910 vintage champagne to feel rich. You might think you would need to be using fine silverware at Commander's Palace with multiple waitstaff hovering nearby to feel rich. Instead, we sat at our second-hand dining table in our two-bedroom apartment. We ate using very nice stainless that was a recent gift from my Mom and Dad. Although we've done a partial tally of our personal property loss for our insurance claim, there's no telling how much we lost in the flood brought by Katrina. Our house, all our furniture, almost all our clothes, all our books, albums, photos, hundreds of cds and dvds--all lost. But as I say, I am nevertheless rich, and I realized this again when my wife served the lasagna she had baked. Yes, you probably guessed what a great cook she is. My wife can enter a cold kitchen and serve you a gormet meal in just 45 minutes. But this is not why I feel so rich. What did it was the lasgana server. Yes, that's what I said. In case you've never heard of it, a lasgna server is a wide, flat serving untensil especially handy for, surprise, serving lasagna. This is one of the serving pieces that came with the new stainless set. I said to my wife and daughter, "We have a untensil just for lasagna? We're rich!" And I meant it. After all we've been through, after all we've lost, we still have so much. We have a nice place to live, clean clothes, food on the table, access to doctors, two good automobiles--too much to list. For Pete's sake, we've even go a lasagna server! I know I get grumpy on occaision. I worry about the money lost and the sentimental treasures destroyed by the flood. I know I'll never have as much stuff or money as Bill Gates or the Saudi Royal family. But I know that ultimately, I'm so lucky, and so fortunate. I am rich.